GASTRONOMY by Joy: A Turmeric Kinda Day! But I do agree that we have to fight cancer and going natural is one of the best ways to prevent cancer. 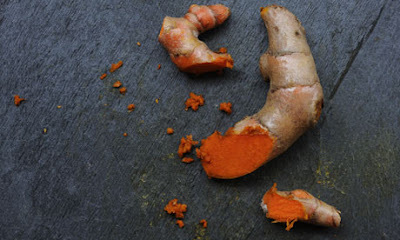 Thank you for this enlightening post on Tumeric and how it can possibly help alleviate chances of getting cancer. I was also able tor read one more advantage to Tumeric powder as an intake -- it helps relieve pain swelling. I've yet to try it since I've been having those swollen moments just having this cast on my foot. Another chicken dish I've read today, it makes me crave more for any chicken dish... and glad to know about the Tumeric. Another vegetable that you can try to battle cancer is ashitaba plant. It is a super food that contains lots of nutrients from the roots, stem and the leaves. The stem has chalcones, the yellow sap, the best fighter against the big C.
i remembered just this week when my mom scolded me because the luyang dilaw is missing but i just put it with other luyas. hahaha. now i know why mother scolded me.. to lower her bad cholesterol level. Thanks for the nice info :) The turmeric looks to me like ginger :P how does it taste? Great recipe. I wish you can allow me to feature this one up at my food blog. Thanks! I love Chicken Curry, I'm so gonna try this recipe! Good recipe. I agree with the health value of turmeric. The Indians(my indian friend told me) use it too to remove the toxins on the fish skin.Before they fry the fish, they rub it with turmeric and I also do it. Good recipe here. I have to tell my aunt about this. Thanks for sharing.